Video 2 Photo allows you to export one or more high quality photos from your videos (and Live Photos) in a quick, fun and original way. Sometimes you hesitate between taking a photo or a video. Take a video! 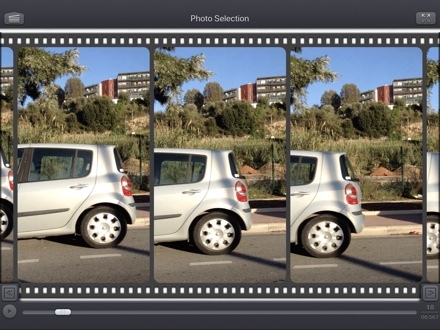 thanks to Video 2 Photo you can now extract from your video as many images as you like! You have inadvertently recorded a video when you wanted to take a picture. 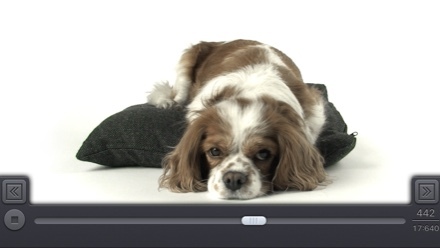 With Video 2 Photo you can finally recover photos from this video. Taking The good picture of an object, animal or person that moves is almost impossible. With Video 2 Photo this becomes feasible. Taking a picture of yourself is always difficult. 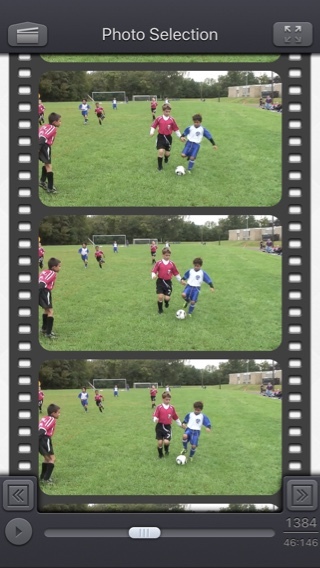 With Video 2 Photo you can choose exactly the right image that suits you best. You need a precise tool to export multiple consecutive photos and use them with another application. Choose a representative picture of your best videos and put it as wallpaper or print it in order to have it always with you. Have fun watching your favorite movies frame by frame and find the little detail that you had never seen before. and even send it as a tweet or to Facebook! If needed, some power user settings, located in the settings application, allows to change some parameters like the output file format (png/jpeg/heic), the associated meta-data, and some behaviors of the application. In this screen, You can swipe left/right to switch from the camera roll of your device, the recent videos, the Favorites, the Live Photos and the iTunes File Sharing content. 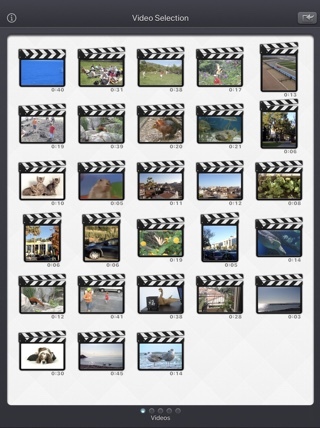 (videos that you can add in the Video 2 Photo folder using iTunes of the Files app from Apple). Swipe up/down to view more videos. Touch the video you want to extract pictures from. Tip: You can also directly record a new video, or import a specific one, by using the top right import button. 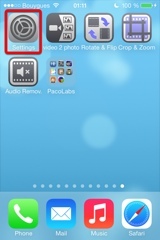 Tip: Video 2 photo can also be launched from the Photo app (or another app sharing videos), as a share extension. Tip: The previously selected vedeo is highlighted in blue. 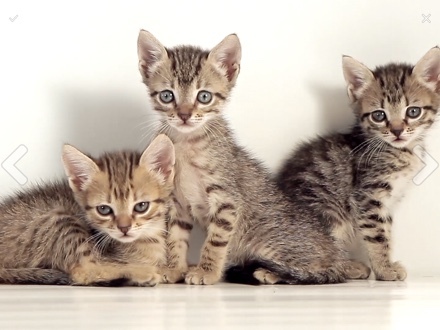 Swipe up/down to view the images in the video, one by one. Move the slider at the bottom to have a quicker scroll. Press the arrows, at the bottom, to show the next or previous frame. Press the top right full screen button to enter full screen mode where you can focus on a specific part of the image and show the next or previous frame. When the video is not playing, touch the image you want to export. Tip: Pinch out or long press on a specific frame to view it in full screen. Tip: While the video is playing, use the arrows to fast rewind or fast forward. You can export the image from here, selecting the desired button. Generally, you will want to export it to the camera roll (where all your videos and images are stored in the device). Touch (or pinch) the image to view it in full screen. Before exporting you can press the top right icon to crop the image. The "Export multiple photos" button is quite special. it will display a dedicated screen with ehanced features. Tip: More infos on iTunes File Sharing which is also assessible by using the files app from Apple. Tip: Touch the text at the bottom of the list, to directly access to the Video 2 Photo part of the Settings application (ans select the metadatas to be added in the exported images, and to some other options). 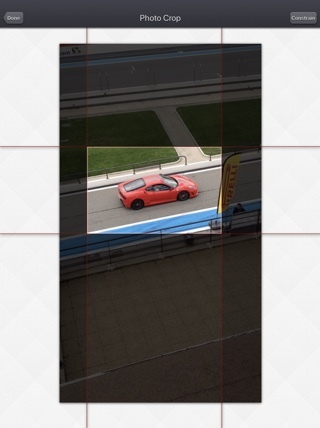 To crop the image, drag the red bars to the desired size and press Done. Tip: Press the Constrain button to set a ratio constraint or to cancel your current crop. 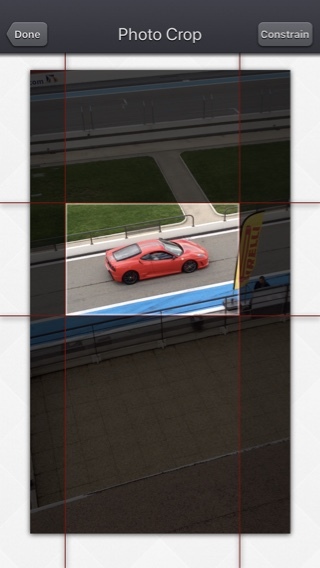 From this screen (accessible from the export screen) you can export multiple consecutive photos. Select the options you want, and press the export button. A safety check is performed to ensure that you don't export images if there is not enough disk space on your device. Tip: The application can be used to open video file in every application that supports the Open-in feature, or the Action extension (like the Photo app). Q : Are there some settings in the application. I'd like, for instance, to change the exported images from .png to .jpeg files. 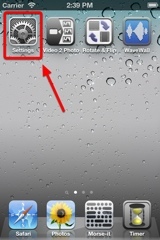 Yes, you can go to the Settings application -> "Video 2 Photo" section. 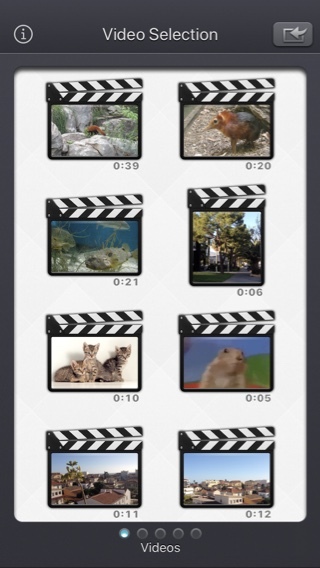 From here you'll be able to customize some feature of Video 2 Photo. to store some videos using the Files app. Once the video is not needed anymore, it is up to the user to delete it manually (using another time his computer, or using the Files app from apple). 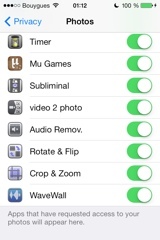 You must go to the Settings application -> "Privacy" -> "Photos", and set the app (Video 2 Photo) to ON. Q : The videos imported from my computer are not visible. How to solve that problem? Unfortunately, Video 2 Photo (and every other app from the Appstore) cannot access those videos in the Video application yet. Video 2 Photo, also supports the iTunes Files Sharing feature, so you can manually add some external videos to Video 2 Photo quite easily. In case the video to be deleted is located in the iTunes File Sharing folder, here is how to access and delete it : http://support.apple.com/kb/HT4094. The Files app from apple can also be used for that purpose. Ability to visually select the start and stop frames in the batch export screen. Fix to avoid a crash when the Files button of the video import popup is selected (on iPads with iOS versions lower than iOS11). Added the possibility to disable the tutorial (by touching it). For 360° input videos, the Spacial Media information is injected in the exported images as Photo Sphere XMP Metadata. 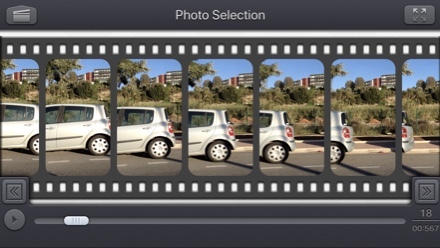 In export multiple photos mode, an option is added to skip some frames (e.g. save one frame every 8 frames). Batch export function. 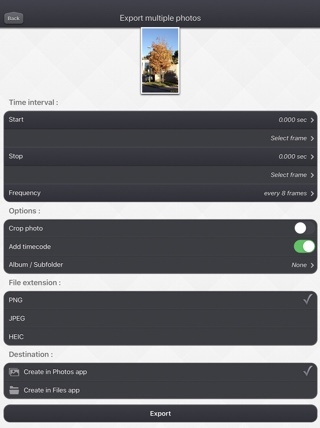 Export multiple consecutive photos to the camera roll or to the Files application at the touch of a single button. 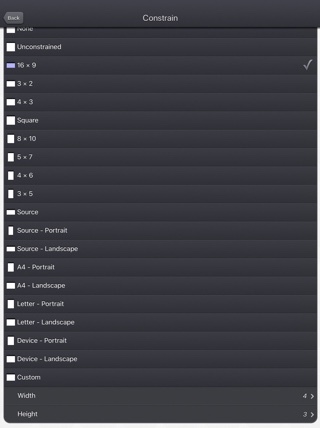 Ability to export the image as a HEIC file (if your device supports it). 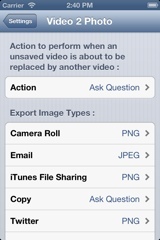 When the media is saved to the camera roll, it is automatically associated to an album named "Video 2 Photo". 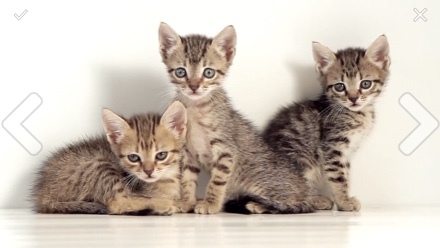 The file name of the exported image is now prefixed with the original file name of the source video, followed by the date and time of the image. The date and gps information are now added to the PNG file (if the option is enabled in the settings). 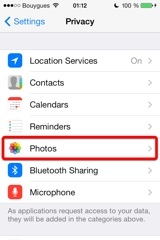 Fix for metadata not included in images exported to the camera roll. 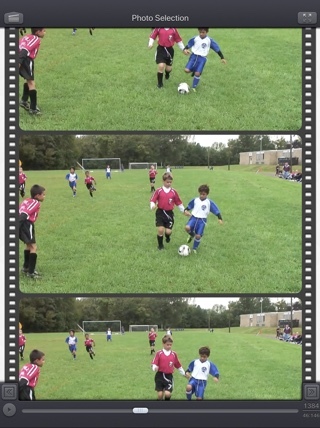 Here is the latest version of Video 2 Photo! You thought selecting the perfect photo was an easy task. Well, with this 2.2 version, it's gonna be even easier ! New: It is now possible to view the image in fullscreen, (and to focus on a specific part of the image) before selecting it. New: When a .jpg image is exported with the date metadata, the local time is now used (and not the UTC time). In case you want to change that behaviour, you can go in the Settings application, and check the available options in the Video 2 Photo section. New : Live Photos support. It is possible to view all the images contained in the Live Photo, like you are used to do it with your videos. New : Share extension support. A live Photo can also be imported directly from other applications like the Photo app. New : iPad Pro compatibility. Enjoy the app on your iPad Pro, and preview your images with an incredible resolution. Fix : When the .jpg extension were selected (option available in the Settings app), the GPS and the date information were not correctly added in the metadatas. Fix : Improved stability of the application. New : Action Extension. 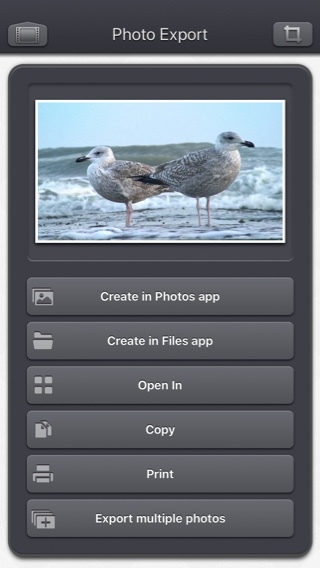 It is now possible to extract your photos from a video, directly inside another application (like the Photo app). New : Buttons added to jump to the next or the previous frame, for ultra precise selection. 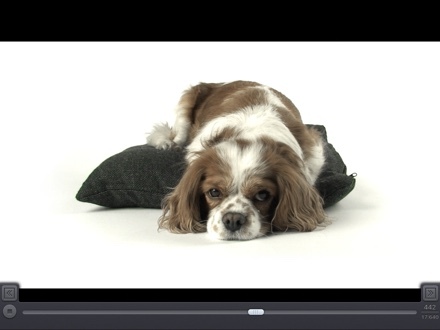 During video playback, jump to the next or previous 2 seconds. New : Option added (in the Settings app) to keep the defined cropped area from one image selected to another, in the same video. New : Option added (in the Settings app) to add a timestamp HH:MM:SSS overlay on the bottom right part of the image to find where the frame was located in the original video. Fix : Automatic screen lock disabled during the movie loading. Fix : Sharper images on iPhone6+. New : Possibility to hide an export destination (in the Video 2 Photo section of the Settings application). New : Nicer crop constrain selection screen that also gives the possibility to define a precise ratio. New : Tencent Weibo export support. Change : Flat icon, status bar integration, new image background that reacts to user motion. Change : Improved Open-in export destination that gives more choices to the user (some of them may however be redundant with the other export destination). Fix : Avoid a crash of the application, under low memory conditions, when the movie reel is scrolled. New : It is now possible to add a constraint (e.g 4/3, 16/9, square, device portrait) when cropping the image to be exported. New : An icon is added to every export button for a quicker identification. Change : Remove device status bar in full screen image preview. 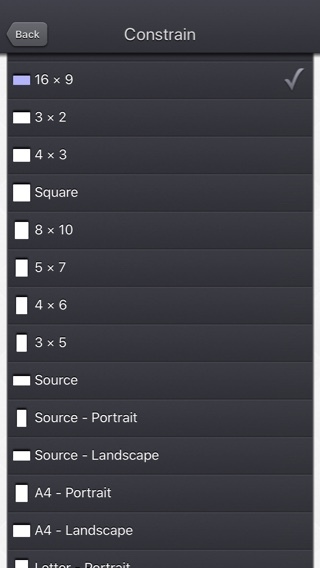 Change : Keep the scroll position of the list in the export screen across different image exports. This allows quicker multiple image exports. Change : Reorder the different export buttons in the list. New : Expert option (off by default) in the Video 2 Photo section of the Settings application to add the creation date of the original video in the meta-data of the exported JPEG images. New : Expert option (on by default) in the Video 2 Photo section of the Settings application to add the GPS information of the original video in the meta-data of the exported JPEG images. 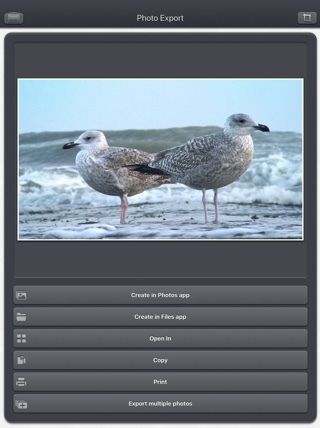 New : video2photo:// URL scheme support to launch Video 2 Photo from another application. New : The preview image in the export screen can now be visualized in real size (pinch, long press and press gestures handled). New : Improved quality of the images, when exported to the Camera Roll (the new default type being PNG). New : New "Video 2 Photo" section in the device settings application, allowing to customize the application, if needed. New : In case of an input video selection change, It is now possible to save the current video (if it was directly recorded using the camera), avoiding any unwanted data loss. 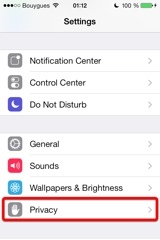 (this option can be customized in the settings application). New : It is possible to define the file type (JPEG or PNG) used for export in the settings application. A pop up can also be displayed every time, if you need frequent changes. New : The original GPS location is associated to the photos exported to the Camera Roll. New : iOS6 feature - export to FaceBook. 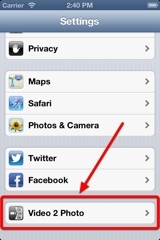 New : iOS6 feature - export to Sina Weibo. New : "Open In" export feature allowing to send a photo directly to another application (handling photo import). New : Video import Handling to allow other applications to directly send videos to Video 2 Photo. Fix : Remove temporary file (from a temporary recorded video) when the video is not used anymore (another video is selected). Fix : Small bug fixes and improvements. 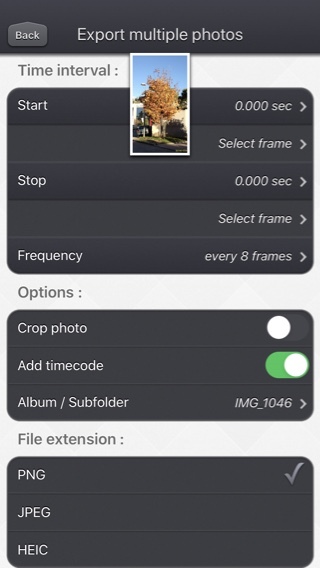 New : It is now possible to crop the picture before exporting it. Change : Improved user messages in case access to the medias is denied (globally or specifically). Change : Improved appearance for navigation bars.